In Andalusia it is still possible to ride through the most unimaginable landscapes for several days, combining nature with the most ancient traditions. To the Southwest of Sevilla, we will ride on the pilgrimage roads to El Rocío. Leaving from the south of Sevilla, we will stay at some beautiful and traditional country houses, with all the charm of the old times. We will ride by the environs of the Doñana National Park. The landscape of this area is of great diversity: forests of pine and savin, eucalyptus and cork oaks; dunes, marshlands and preserves. Thousands of birds come to spend the winter here. We will ride on sand tracks, ancient bridle paths, and get to El Rocío, named the International village of the horse. All the houses have stables and all the streets are sand tracks. In the times of the pilgrimage, this village hosts thousands of horses - many of them Andalusian stallions. A unique natural area, full of the most authentic traditions, the kingdom of the Andalusian horse. The Andalusian horse is spirited, strong, temperamental and of unquestionable courage. The counterpoint of these qualities is its docility, being a very sensitive horse, obedient and easy to handle. The Andalusian horse possesses, through inheritance, a measured and balanced command of its movements and it is a delight to ride. Best time to visit: Set dates in February-March-November. Group size: Minimum 6 riders - Maximum 10 riders. Climate: The climate in this are of Spain is nearly tropical. Winter months are strongly recommended - with gentle temperatures, maximum 18 - 22ºC and minimum temperatures at 8-10ºC. Average days of rain in the February – March – November months is 5 days per month. 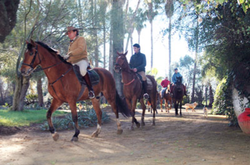 Your hosts and guides: The Sevilla rides are lead by Alfonso, the owner of the stables in Sevilla – la Corbera, and Maria Elena. They are knowledgeable, qualified, hospitable and terrific travel companions. The assistant guides and helpers are enthusiastic, motivated, attentive and charming. Lodging is very comfortable and full of charm. You will stay at traditional Andalusian country estates and cortijos (the Andalusian country houses). Breakfast, aperitifs, lunch and dinner are included while on the trek. The local cuisine is excellent and much consideration is taken when planning the meals to provide visitors with a sampling of the many different dishes produced in the area. Lunch is usually a picnic in the countryside with set tables, chairs... and small feast everyday! Some lunches will be cooked on the spot; others prepared the village bars o restaurants, always exquisite. Dinner is at the hotels will feature a varied selection of the typical cuisine. All the drinks are included during the meals. Tasting of Spanish red& white wines; sherry; beer, juices, soft drinks and water. A support vehicle will follow the riders during the entire trip, meeting for aperitifs, meals and at night. Pick up Meeting time around 16:30 – 17:00 at the Sevilla airport – or at the Santa Justa train station if you are in Seville already. 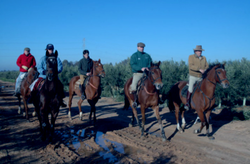 Transfer to the equestrian centre La Corbera, south of Sevilla, near Utrera, about 20-30min from Sevilla. It is a beautiful Cortijo, a traditional Andalusian country estate. 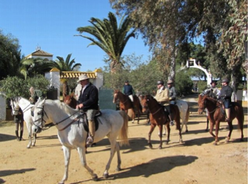 Introduction to the horses and the stables.Welcome drink at the Cortijo and distribution of the rooms. The accommodation is at the finca, with 8 charming bedrooms in overlooking the fields and the horses. Welcome dinner and night at La Corbera. This day will be a short ride for the riders and the horses to get accommodated. Ride through agricultural land and pine woods. Aperitif in the countryside. near the pine woods. Some trots and canters to the beautiful Hacienda La Indiana. Picnic lunch near the Hacienda or in the cortijo. In the afternoon, ride back to La Corbera. This afternoon, after the ride, we can organize a visit to the Hacienda Yeguada Ayala, breeder of the some of the best Andalusian horses in the worlds, and a farm with nearly 200 mares. Dinner and night at la Corbera. 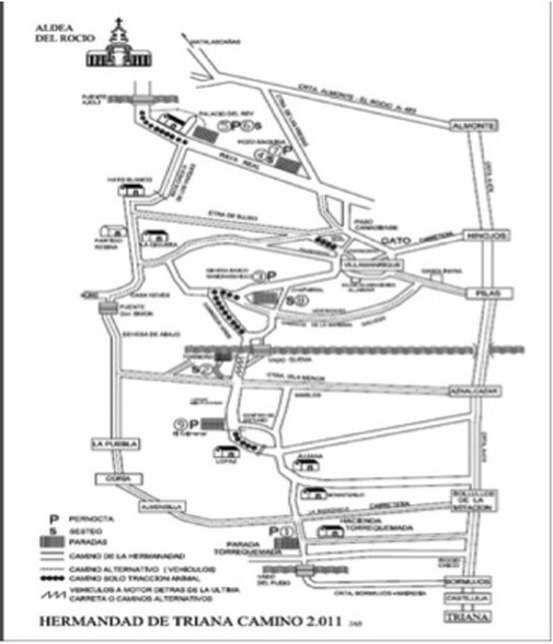 Ride will start at Torrequemada, a XVI c. Hacienda of Andalusia. After a brief visit of Torrequemada. This is a traditional stop of the pilgrims on their way to El Rocio, the Camino de Triana, from where we will start the ride. Through farming land of olive trees we will get to the pine forest for the aperitivo stop. We will follow the Camino de Triana, and stop for a picnic lunch at the Dehesa de Torneros. In the afternoon we will cross the river Quema, where the pilgrims heading towards El Rocio, traditionally are baptised!. We will ride on to Villamanrique de la Condesa, to the beautiful cortijo Ardea Purpurea. Dinner and night at this charming place dedicated to the Purple Heron, due to its great location for birdwatching in the boundaries of Doñana. Ride through pine woods and the Dehesa de Boyal, a forest of holm and cork oaks. We will follow the Camino de Pilas and later the Camino de Hinojos, where we’ll stop for an aperitivo. Then we will join the Raya Reall , an impressive wide sand avenue surrounded by forests of pines, cork oaks, and eucalyptus. where many trails meet for the last part of the pilgrimage. We will have lunch near the beautiful Palacio del Rey, a royal hunting lodge built for Alfonso XIII. In the afternoon we will reach the destination of our pilgrimage on horseback: El Rocío, the international village of the Horse, with the church Ermita de la Virgen del Rocío. It is a unique village: all the houses have stables and all the streets are sand tracks. In the times of the pilgrimage this village hosts a million people and thousands of horses! 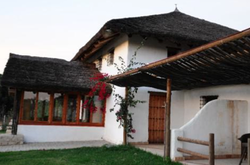 We will stay at a traditional house of El Rocío, which has been restored with all the comfort. Dinner at a local restaurant with a beautiful view of the marshlands. Half-day ride following the “Camino de Moguer”. This camino follows the stream of La Rocina, which runs for 40km, and it is call “la Madre” and its waters area the source of the marisma – the marshlands which are the heart of Doñana. Along its banks one can often see many different species of birds and at times, deer and the wild black pigs of the park, as well as a variety of plant species. Aperitif stop n the countryside surrounded by pine trees where the Hermandades de Huelva rest when making the Rocio pilgrimage. Ride back to El Rocio and lunch at a restaurant. Afternoon free to visit El Rocío and enjoy the nature and the Doñana nature reserve. Dinner and night at El Rocío. This evening we can enjoy some spontaneous flamenco at a local bar. This day we will ride in the Camino de Hinojos and ride through La Matanza, a private bull breeding state which belongs to the well known breeder Borja Domecq. Aperitivo in the countryside. We will continue the ride towards la Calera, where we will stop for a picnic lunch. In the afternoon we will ride to HInojos and then on to Villamanrique. Dinner and night at the Cortijo Ardea Purpurea. Morning ride through the pine forests, dehesas (holm and cork oaks estates) and private fincas. Aperitivo and picnic lunch in the countryside, near the Hacienda de Lopa. Through the beautiful pine forests we will reach the Camino de Aznalcázar and the Nature Reserve Dehesa de Abajo, a beautiful lagoon, rich in birdlife, common land whre the local cattle grazes. Picnic lunch with views of the waters of the Dehesa. In the afternoon, we will ride around the reserve to get to the Hacienda de Gelo, end of the ride. The horses and the riders ( in separate means of transport!) will get driven back to La Corbera. Farewell dinner and night at la Corbera. 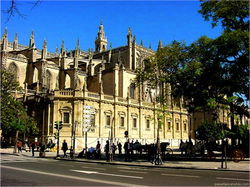 Breakfast and transfer to Sevilla, to the airport or the train station (central location in Sevilla). Sevilla is the capital of Andalusia and of the province of Seville. It is situated on the plain of the River Guadalquivir, with an average elevation of 7 metres (23 ft) above sea level. The inhabitants of the city are known as sevillanos or hispalenses, following the Roman name of the city, Hispalis. Sevilla is without a doubt one of Spain’s most beautiful cities. The Sevillanos are an extremely proud and passionate people. To many Sevilla is not just a place, it is a way of life. The Guadalquivir, Semana Santa, the April Feria, Velazquez, Don Juan Tenorio, orange blossom, the dancing of Sevillanas and bullfights….. Sevilla is bright, beautiful and a city that must be seen and must be experienced. Following the Moorish conquest in 712, Seville came under a long period of Moorish rule. It was during this period that both the Giralda and the Mosque (Mezquita) were built, on the site where the Cathedral now stands. With the discovery of America in 1492, Sevilla developed a monopoly on trade with the New World. It became the arrival and departure point for every expedition to the newly discovered continent. Sevilla began to amass a great wealth, palaces were built, new industries were created and the whole city was a hive of activity. All financed by American gold. In 1929 Sevilla hosted the Ibero-American Exhibition and in 1992, the Expo. 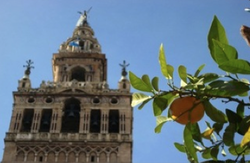 Both of these events had a significant impact on Sevilla to become the beautiful city you can discover nowadays. The Parque Nacional de Doñana is one of Europe's most important wetland reserves and a major site for migrating birds. It is an immense area; the parque itself and surrounding parque natural or Entorno de Doñana (a protected buffer zone) amount to over 1,300 sq km in the provinces of Huelva, Sevilla and Cádiz. It is internationally for recognised for its great ecological wealth. Doñana has become a key centre in the world of conservationism. The effect of this extraordinary mélange of land and water was to create an environment shunned by people but ideal for wildlife. As early as the thirteenth century, the kings of Castille set aside a portion of the Doñana as a royal hunting estate; later the dukes of Medina Sidonia made it their private coto too. One of the duchesses of Medina Sidonia, Doná Ana de Silva y Mendoza, indulged her antisocial instincts by building a residence there that was more hermitage than palace. As a result, the entire region came to be known as the 'forest of Doná Ana', or Doñana. In the eighteenth century, Goya is known to have visited the Duchess of Alba at the Palacio de Doñana when she was its proprietress. Subsequently, the land passed through many hands before the official creation of the parque nacional in 1969.